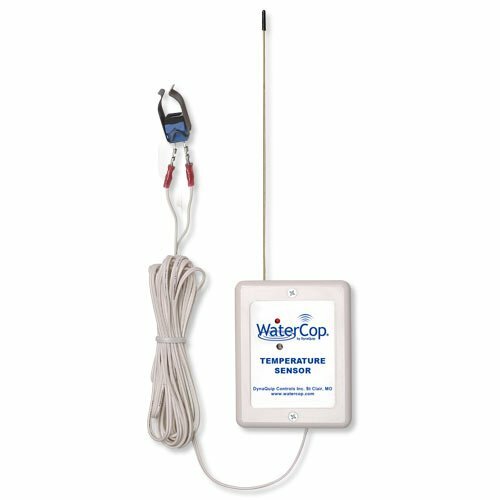 WaterCop Low Temperature sensors are placed at key locations to monitor for abnormaly cold temperatures. If potential freezing conditions are reached, temperature sensors send a wireless signal to the WaterCop valve to close the water supply. Pipes may continue to freeze, but the water has been turned off. Place sensors at locations that are highly susceptible to freezing and bursting such as those feeding outdoor garden hose fixtures or pipes that are located in exterior walls, attics, crawl spaces or other lightly insulated areas of the home. Perfect for zoning or multi-family, sensor frequency codes can be set to communicate with a specific WaterCop shut-off valve. Transmission range is upto 200 feet. WHX1 signal repeaters may be used to extend range if necessary. Low Temperature sensors can be powered with (2) AA batteries or an optional AC power adaptor (ACA100). Batteries should be changed every 6-12 months. Sensors sound a low battery warning chirp. WaterCop Low Temperature sensors are placed at key locations to monitor for abnormaly cold temperatures. If potential freezing conditions are reached, temperature sensors send a wireless signal to the WaterCop valve to close the water supply. Pipes may continue to freeze, but the water has been turned off. Transmission range is upto 200 feet. If you have any questions about this product by DynaQuip, contact us by completing and submitting the form below. If you are looking for a specif part number, please include it with your message.